I'm making a pastel pinky/purple colour. Before you start this tutorial you MUST have extremely light hair, mine is a pearl blonde. (I know this is different from my usual plushie tutorials but what can you do). ((I look so terrified in photos)). 1. Your colour choice of hair dye. If your hair has yellow tones pink and puple work best, green and blue need white blonde. I used Fudge Paintbox Blueberry Hill and Pretty Flamingo (i live in Australia so that's all i could find). 2. Alot of conditioner (a hell'alot) I used TRESemme' because i love the smell. Apparently the conditioner HAS to be white, i'm not sure why. 4. A hair dye brush thingy (i'm not very technical). 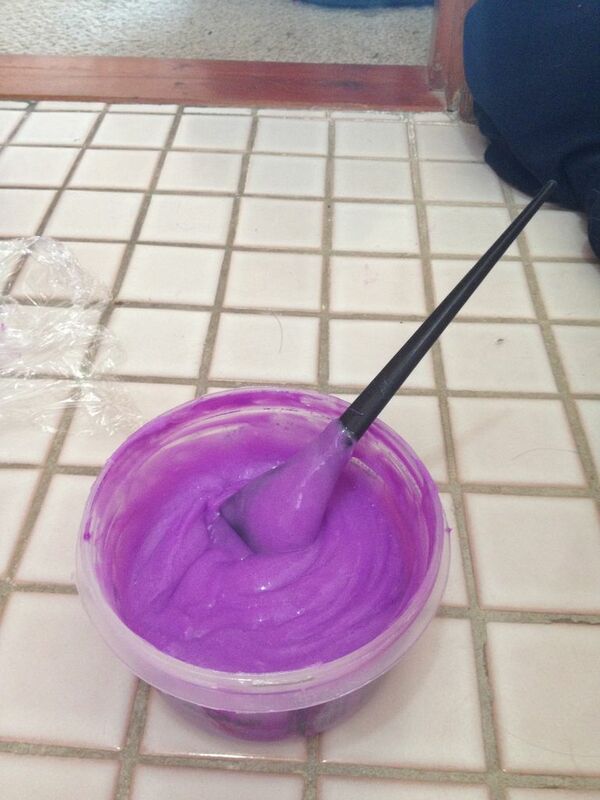 Take your conditioner and put a substancial amount in the bowl, then add a dab of your colour and mix. If you need more add more colour, if its too dark add more conditioner. The colour of your mixture will wash out slightly lighter depending on what brand of dye you used. I've noticed paintbox stained my hair extensions pretty much the same colour and i had ALOT of trouble fading it. Once you have alot of the mixture in your desired colour, you can start applying! Now seperate a section and use your brush to apply to dye. If you have trouble seeing the back of your head use a mirror. Then after the bottom section is done do the top, dont focus on you roots too much, the most important part of the hair are the ends. Then massage mixture into your hair and go through it making sure it's all coated evenly. The processing time is really personal prefference and depends on the dye. I'm going to leave it in for 1 hour, but some people leave it in for overnight. Wrap your hair in cling wrap or a shower cap. This traps in the heat from your heat and makes the dye process better. In your first picture, your hair looks like Lightning's from Final Fantasy! Its so cool!